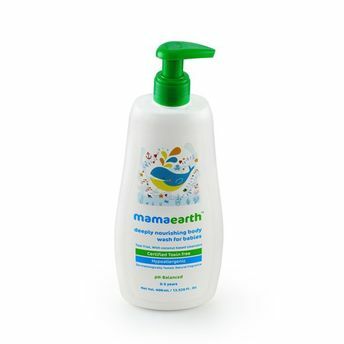 Mamaearth's body wash makes bathing time both fun and relaxing while gently cleaning your baby's delicate skin. The convenience of a shampoo and body wash in one refreshing foam free preparation. Guaranteed splashes and smiles! Mamaearth’s nourishing body wash has the best ingredients from nature like Aloe Vera, which helps moisturize and Allantoin, which helps soothe your baby’s body and wash away the dirt and grime. Glycerin extracted from coconut oil helps in nourishing the skin and increases the moisture content in your baby’s skin. Orange essential oil not only provides a delightfully delicious bath but also gives your little one a fresh and clean feeling all through the day. This body wash is MadeSafe Certified which makes it the safest and the best body wash you could choose for your little one.